Shortbread cookies are a sentimental favorite of mine. They are buttery and sweet and simple and refined! They can be made with as little as three ingredients… I use five! When I was in fifth grade we were living in England. Our class took a field trip to a “sister school” that was having home economics that day… and I learn how to make shortbread cookies. They were not rolled but made the traditional way… the dough was patted in a pie pan, scored, sugared and baked. They were crumbly and delicious. I became an instant fan! Whenever I bake shortbread cookies, their buttery smell evokes childhood memories of a little girl full of flour happily baking for the first time! 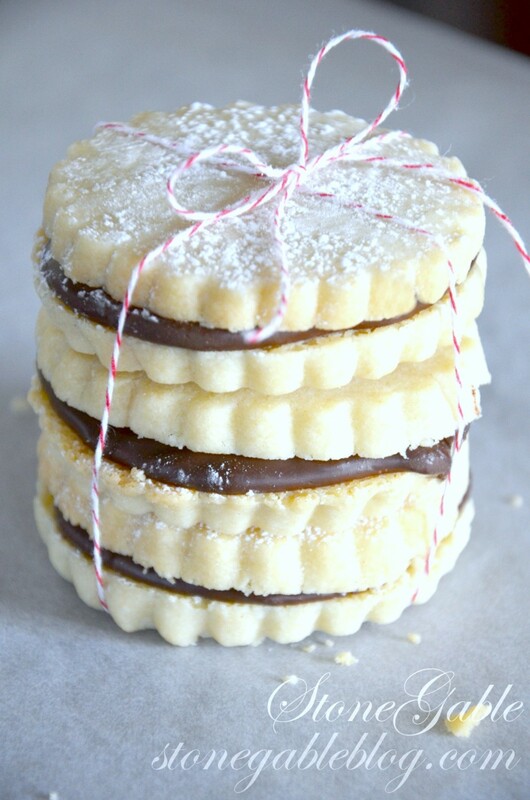 Here are a couple of tips to make your shortbreads fabulous! Cream butter with an electric mixer for 3-5 minutes. Set a timer… super important! 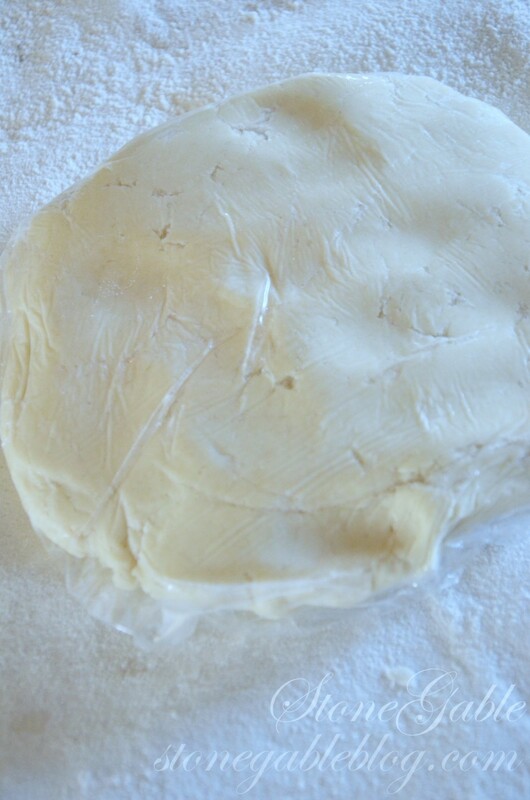 Wrap the dough in plastic wrap and let it “rest” in the refrigerator for at least one hour! 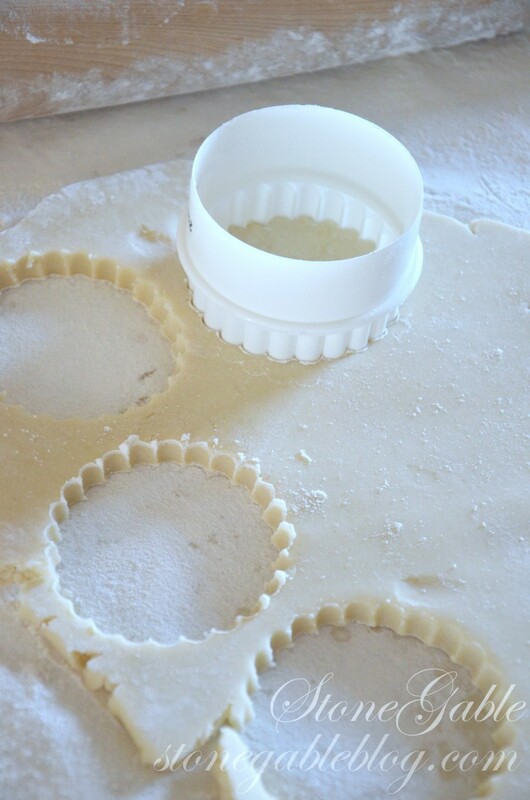 Roll out dough and cut them with a fluted round cutter. So classic! 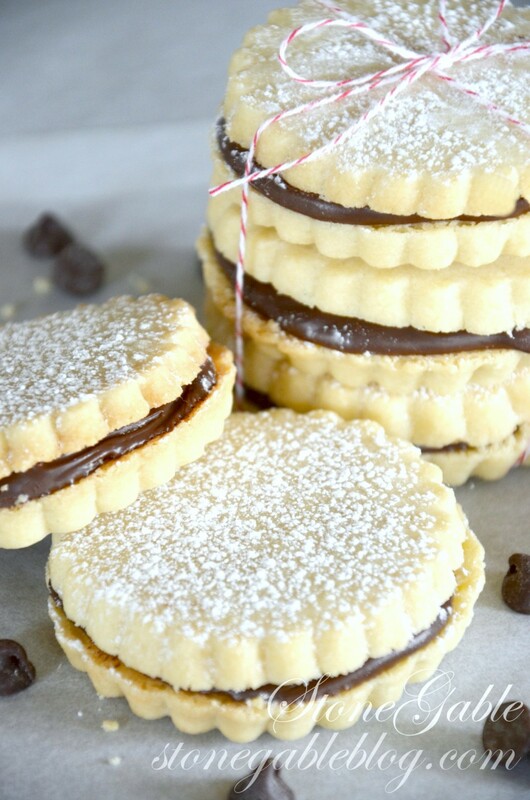 A buttery, crumbly shortbread cookie with semi sweet chocolate sandwiched in between. Sift the flour and the salt together and set aside. 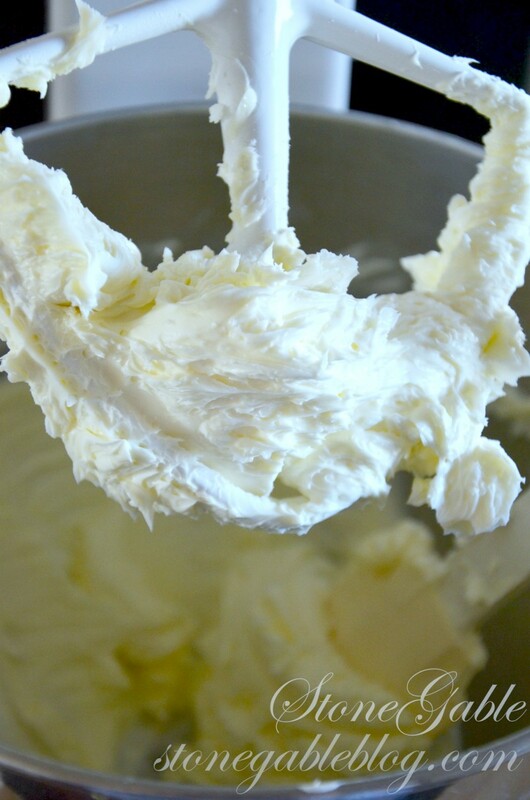 Cream butter using an electric mixer until very fluffy, about 3-5 minutes. Add the confectioners sugar and beat for 2 more minutes. Add vanilla and mix to incorporate. Add flour mixture in thirds, starting on a low speed. Mix until all the flour is incorporated. Put the dough on a big piece of plastic wrap and form into a disc. Seal with plastic wrap and refrigerate for one hour. Roll dough about 3/4 inch thick and cut out cookies. I used a fluted 2 5/8 inch round cookie cutter. Place the cookies on a silpat or parchment lined baking sheet. Bake for 13-15 minutes. Shortbreads should NOT brown. They should get very very slightly blond! They are wonderful dusted with confectioners sugar and eaten just like that! Melt about 2/3 cup good chocolate chips in the microwave in 30 second increments until the chips are just melted and you can make the chocolate smooth and spreadable by stirring. 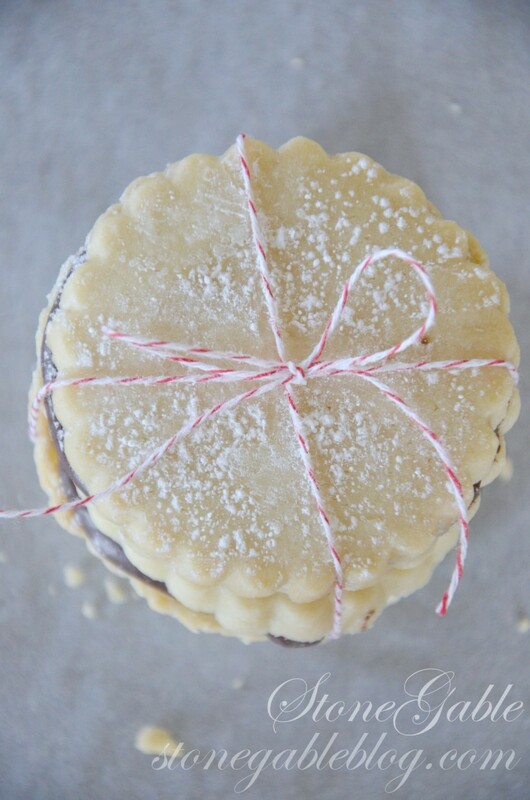 Spread a dollop of chocolate on the back of one of the cookies and top it with another. Dust with confectioners sugar. Let harden. They will keep in an airtight container... if there are any left! 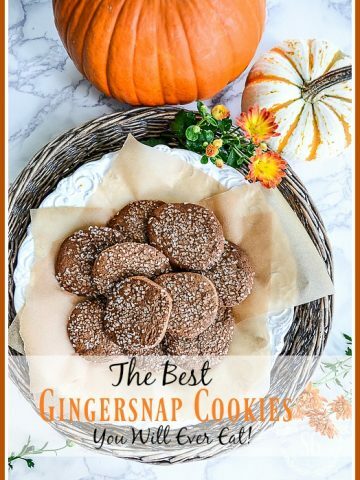 Remember to pin this to your RECIPE or COOKIE Pinterest board. You can follow me on Pinterest and see all the great recipes I am finding to pin HERE! Of course the photos are beautiful. Why all the comments from people who PLAN to make them? Doesn’t it make sense to post comments from people who HAVE made them? MJ we are a part of a fabulous community. I love to hear that people are planning to make something. Inspiring others and sharing comments are just a two of the wonderful things about StoneGAble. Keep those comments coming! I have never made them, but I will now! I’m wondering if Nutella would be a good filling? I bet it would. I’m probably one of the only people on the face of the earth who is not a Nutella fan. I have never been a fan of Nutella either, Yvonne. It seems there are so many recipes with Nutella any more, but I’ll stick with my chocolate. Yum! These look great! and so do-able! Thanks for the hints! Think these would sell great at our church fall festival in 3 weeks. Thanks so much, Yvonne! I’d probably put a few in cello bags to keep sugar from messing. I also really like shortbread cookies. I’ve never made them!!! But these look like a pretty cookie for neighbors at Christmas!? I’m not sure, Pamela. Give it a try and let me know how it works. Pamela, I too am curious if gluten free flour would work!! Try it and tell us all!! Thank you. Stupid question-do you measure 2 cups all purpose flour & then sift it or do you sift and then measure 2 cups? Great question Cris. Measure first, then sift. You will love them! They are so scrumptious! I love chocolate and cake above seem so good 🙂 thanks for sharing the information. When I was growing up in NY my Scottish grandmother who was living in Illinois at the time send Scotch Shortbread every year for Christmas. Now I send my AZ grandchildren Scotch Shortbread every year from my home in OK. It just is not Christmas without Scotch Shortbread. So good to hear, Shauna! Will try these cookies for my daughters wedding, as favors. Planning on using royal icing and then putting their monogram on them. I love shortbread cookies. Can not wait to try this recipe thought. Thanks for sharing . I will have to try this recipe with the powdered sugar. I would like to offer a hint, if I may! The shortbreads will hold their shape while cooking if you place the cookie sheet in the refrigerator for 15-20 minutes before baking them. Shortbread cookies are my families favorite cookie! The cookies are pretty thick. Let’s split the difference and try 1/2 inch. I hope these work for you because they are fabulous! 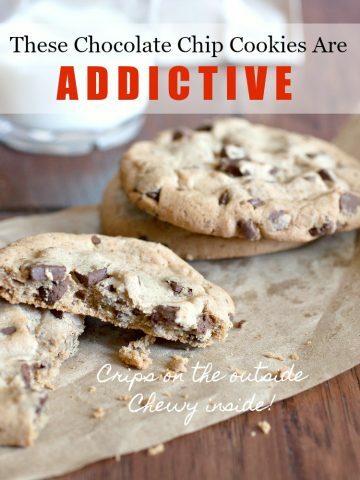 Well, I’m a cookie lover too and this cookie looks so yummy that, I’m going to make it this weekend for my tea time. Thanks for sharing the lovely recipe. Very beautiful cookies and nice pics also. Love it very much! I cannot wait to give these a try! They look amazing and the filling options are endless. I feel seasonal versions coming on! Swoon! 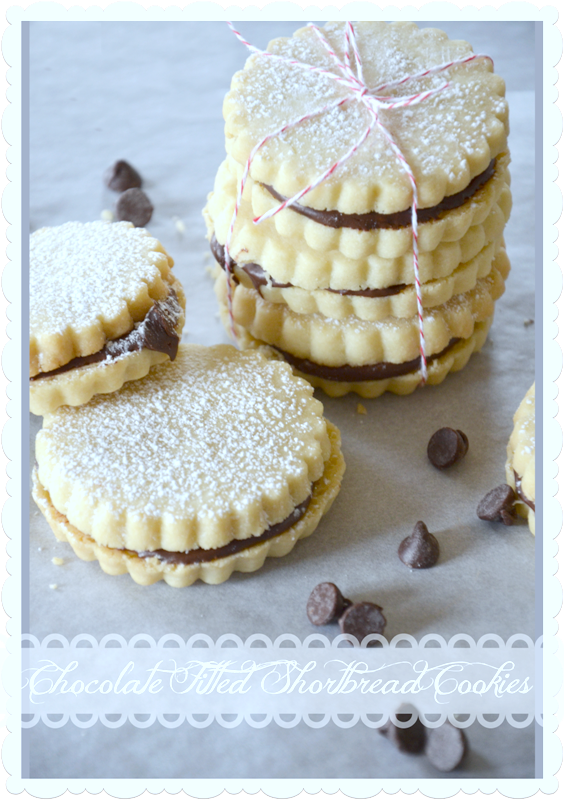 What pretty little shortbread sandwiches! Oh, these are beautiful! And I love shortbread! Hubs loves ’em, too. Can’t wait to make these. Thanks so much for sharing them! Patty, did you use the “Pin It” on each post. I just tried it and it seemed to be fine for me. Give that a try! Good morning, Yvonne. Just like everyone else, I love your blog and everything Stone Gable. But my email inbox is full of old Stone Gable emails because I have trouble pinning from your site. Any hints for me?? Anyone else have that trouble?? Thanks and have a fin Saturday! Is there ANYTHING You do that you don’t make look heavenly good? Seriously these would just do me in:) In a good way of course! I know what I’m doing tomorrow. They look so yummy. I can’t wait to try the recipe! Wow, these cookies look like the melt in the mouth kind. Thank you so much for that recipe. One could even substitute caramel for chocolate or make both. In my family, we have chocolate lovers and caramel lovers. They would be delicious eaten just by themselves. I usually just have them at Christmas time because of the richness. Now, I am tempted to try them for Easter. Yes, I think a lovely Easter treat! 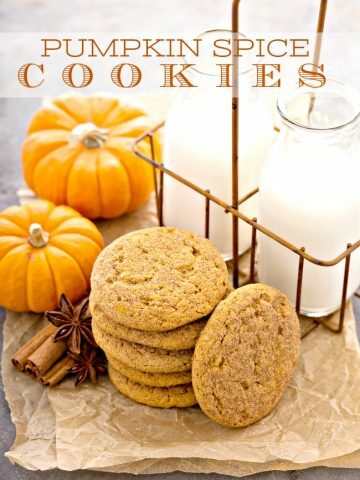 These cookies look so tasty – can’t wait to try them! Thanks for sharing the recipe! I can’t wait to try this recipe. would you mind to suggest a “good” chocolate chip brand…..I ususally use Nestle’s…. Well, you’ve done it now Yvonne, I HAVE to try making these. I wonder if you could put seedless raspberry jam in there or do you think it would just squeeze out. I just found I’m pre-diabetic so I guess I have to be choosy but these seem wonderful for a special treat-thanks! I love shortbread cookies. While in Scotland I had shortbread cookies every afternoon with tea. A small cookie at four o’clock was just the pick-me-up I needed to enjoy the rest of the day sightseeing. Thank you for the recipe. I just printed it, and will be making some this weekend. I’m your new follower & these shortbread biscuits are what brought me to your blog. It took me way back to my childhood days of visiting an elderly lady for Sunday afternoon tea. She made the most delicious shortbread biscuits I’ve ever tasted no chocolate,just sprinkled with fine caster sugar. They were always served on her best china with a crochet doily. Thank you for taking me back to my childhood. I love melt-in-your mouth shortbreads!! Yours are beautiful tied with the bakers twine! Oh, these look soooo good, Yvonne! I love the buttery goodness of shortbread. I’ve done many complex cookies over the years but none satisfy like a simple shortbread. The chocolate is the “icing in the cookie”, Yvonne. Brilliant!! Comforting enough for family…elegant enough for company!!! 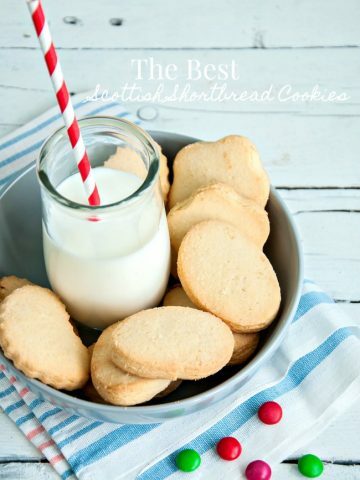 Thanks for sharing your recipe with us…loved the story of you first affection with shortbread cookies!